Using a knife, peel the orange, removing the bitter white pith. Working over a pitcher, cut in between the membranes to release the sections. Squeeze the juice from the membranes and discard the membranes. 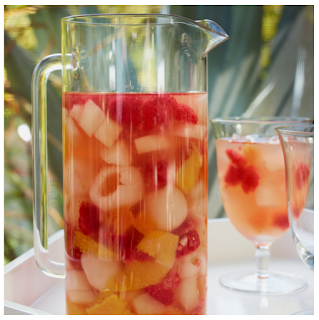 Add the raspberries, pear, sake, bourbon, lemon juice, triple sec, sugar and lychees with their syrup. Refrigerate for at least 1 hour. Stir in the Riesling and serve the sangria in ice-filled wineglasses.